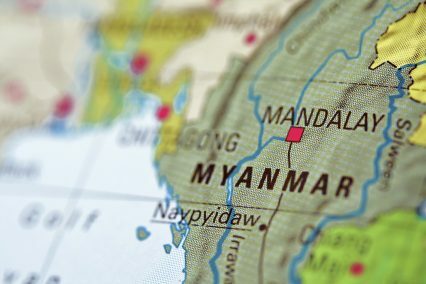 Four more foreign banks have been awarded preliminary Myanmar banking licences by the Central Bank of Myanmar, taking the number of international banks in the country to 13. The latest addition to the burgeoning financial sector are Bank for Investment and Development of Vietnam, State Bank of India, Sun Commercial Bank (Taiwan) and Shinhan Bank (South Korea). The banks now need to fulfil a series of objectives set by the Central Bank in order to receive fully operational licences, including making a US$75mn investment in Myanmar. They have 12 months to complete the commitment. The first round of licences were handed out in 2014, and the four new operators now join ANZ, Bangkok Bank, BTMU, ICBC, Maybank, Mizuho, OCBC and UOB. BTMU was the first to be granted a licence in April of that year. Thirteen banks had applied for the latest round of licences, all from Asia and mainly from neighbouring nations to Myanmar. Myanmar banking is commonly referred to as Asia’s main frontier market. Its former military junta – which still holds significant sway – nationalised all banks upon seizing power in 1962. Subsequently, the country was heavily sanctioned by the west and it is only since 2011 that these sanctions have been steadily removed. Late last year, GTR reported that many western banks, particularly those of US origin, had stopped offering trade finance for business done in the country for fear of being sanctioned themselves, by the Office of Foreign Assets Control (OFAC) – the US entity that administers and enforces economic and trade sanctions. There is much ambiguity about the ownership of important trade infrastructure in the country, with many thought to be still in the hands of individuals that remain sanctioned by OFAC. Any US dollar-denominated business conducted with such individuals would be open to sanctioning, theoretically. OFAC subsequently moved to assuage such fears, acknowledging the complexity and murkiness of the situation, the near-impossible situations banks would have in tracing ownership of certain assets in Myanmar and the damage that would be done to a fledgling US trade to the country should banks be unable to offer exporters finance. To date, the primary infrastructure contracts dealt out in the country’s efforts to rebuild have been to Asian entities. However it is thought that the US government is keen to allow its firms the same opportunities in Myanmar as its overseas competitors.